1 August 2003: "Referal Contest" winner NewsGuy.com! 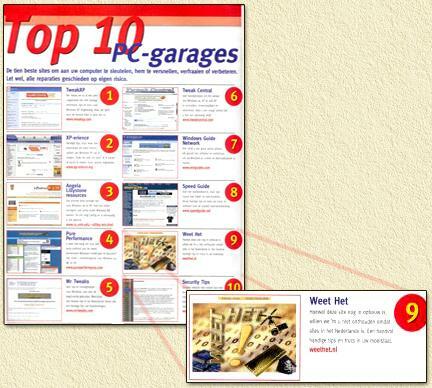 1 Juli 2003: "Referal Contest" winner NewsGuy.com! 1 April 2003: "Referal Contest" winner NewsGuy.com! 1 February 2003: "Referal Contest" winner NewsGuy.com! 1 November 2002: "Referal Contest" winner NewsGuy.com! 1 October 2002: "Referal Contest" winner NewsGuy.com! 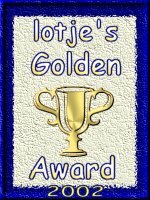 September 26th, 2002: Lotje's Golden Award 2002 ! August first, 2002: "Referal Contest" winner August 2002 at NewsGuy.com! The price, $250, will once more be spent on software registration, domainregistration and hostingcosts. I have to thank all the visitors that subscribed at NewsGuy and mentioned "WeetHet". Juli 12th, 2002: "Approved suitable for all ages" by Websitekeuring.nl. Juli first, 2002: "Referal Contest" winner Juni 2002 at NewsGuy.com! The price, $250, will be spent on domainregistration and hostingcosts. 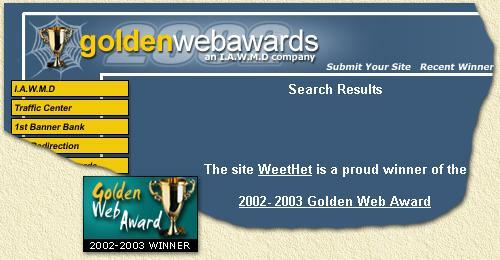 I have to thank all the visitors that subscribed at NewsGuy and mentioned "WeetHet".